Can one find vitamins in packaged juice? What juice is best to drink through a straw? It is more useful to eat a whole fruit or vegetable than to drink juice from it. This is true. Fruits and vegetables contain dietary fibers, which, not digested, pass through the gastrointestinal tract and remove the products of metabolism, excess cholesterol, glucose. As a result, they contribute to the prevention of cardiovascular diseases, diabetes of the second type. Packaged juices, because of the high sugar content (which it is often added by manufacturers as a natural preservative) are not recommended to those who have elevated blood sugar levels. However, there are people who have certain violations in the work of the digestive organs, and therefore they do not tolerate cellulose. It is better for them to replace vegetables and fruits with juices. Juicesare better to drink on an empty stomach. Not all of them, of course. It is not recommended to drink juices before meals to patients with increased secretion of the stomach, since they negatively affect the mucosa. However, if the acidity of the stomach is lowered, then drinking juice on an empty stomach is useful. Juices, especially vegetable ones, stimulate the production of gastric enzymes, so they are useful to drink to improve digestion before eating. Juice, like fruit, is useful in any quantity. Still, drinking juices as water is not worth it. In addition to useful vitamins and macro- and microelements, juices, especially fruit juices, contain a lot of sugar. For example, apple juice contains 9-11% (this is fructose, glucose and sucrose), while the grape one up to 15%. The fat enters the body not only with food, as it is being synthesized from sugar. The fastest of all is soluble sugar. Therefore, it is recommended to drink no more than 0.5-1 cup of freshly squeezed juice. Freshly squeezed juice can be stored in the refrigerator. It is possible, but it must be taken into account that after cooking, useful substances and vitamins start to volatilize immediately and vitamin C is quickly destroyed. Therefore, freshly squeezed juice should be drunk no later than 10 minutes after cooking. Otherwise, it will not differ much from the packaged one. By the way, the open package of juice should not be stored in the refrigerator for more than a day - then mold begins to start there. Moreover, not always it can be seen right away. Juices should be diluted with water. This is recommended for children and the elderly. The child often asks for juice to quench his thirst, and parents agree, thinking that the juice is better than water. However, the more sugar in the juice, the more thirst it will cause - that is, the child will want to drink again and again. If you dilute the juice with water 1:1, the child willquench his thirst faster. If there is a tendency to flatulence, bloating (such problems often occur in the elderly, when the normal micro flora of the intestine is disturbed), it is also better to dilute the juice. The abundance of sugars - glucose, fructose - enhances the processes of fermentation in the intestine. Juices from acidic fruits, such as citrus, destroy the enamel of the teeth. The reason for this is a large amount of organic acids. To exclude therisk, you can drink this juice through the straw so that it does not come in contact with the teeth. Alternatively,you can brush your teeth immediately after drinking citrus juice. At least, immediately rinse your mouth. Under the influence of organic acids, tooth enamel softens and is more easily destroyed by the action of a brush and paste. Vegetable juices, for example, beetroot, it is better to mix with others. First, so you add brightness to the taste, because vegetable juices are more neutral than fruit juices. Second, dilute the too high concentration. In particular, beet juice should first be allowed to settle for an hour or two, and then mixed with apple, carrot or cabbage juices. Some juices have medicinal properties. These include, for example, beet juice and chokeberry juice. They promote the expansion of blood vessels and lower blood pressure. Therefore, you need to use them very if you suffer from low blood pressure. It should be noted that the juice of chokeberry can cause constipation. Therefore, before choosing a juice to correct any health problems, it is better to consult a doctor. Children's juices are more useful than those that are intended only for adults. This is true in the sense that stricter requirements are imposed on the production of juices. 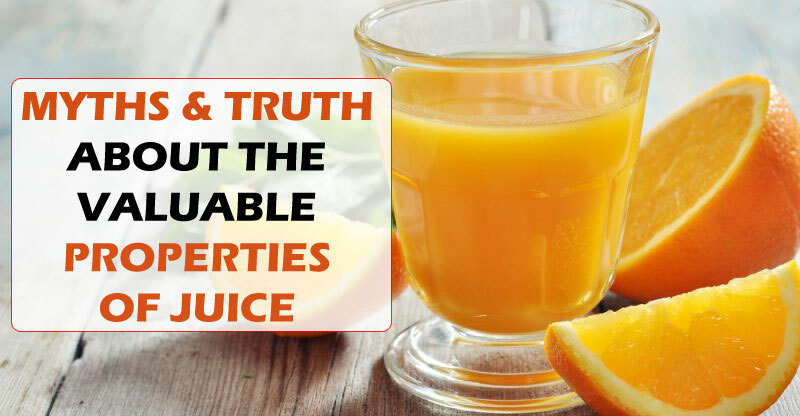 It is not a fact at all that mixture of juices contains more vitamins. There is another nuance here. Strict quality and safety indicators are set for mono juices (from one fruit or vegetable). There are no vitamins in packaged juice. If it is juice of direct pressing, and not recovered from the concentrate, and the manufacturer has not violated the production technology (pasteurized at a temperature of no higher than 80-90 degrees for a short time - less than a minute, to exclude the development of harmful microflora), then the biologically active substances and vitamins will remain in juice. In addition, some manufacturers specifically add vitamin C to the juice. It is better to buy juices than nectars. Juice nectar contains a maximum of 50of juice. However, there are fruits, from which 100% juice can not be made (for example, bananas, peaches, apricots), or this juice will be too concentrated and sour (for example, cherry juice). Therefore, cherries are usually made with nectar, where the content of cherry juice is 35-45% and it is mixed with sugar, apple juice or water.